I love dining on cruise ships. 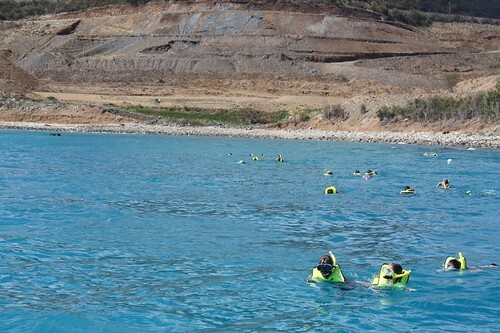 It is one of the best aspects of a cruise. 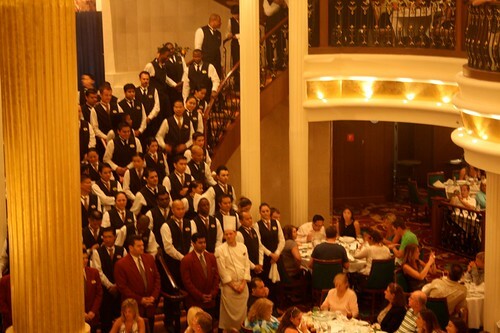 One particular dining experience stands out to me from a cruise my family took on Royal Caribbean Liberty. This experience stands out as much for the transformation I saw the staff go through as for the actual dining itself. In our dining room we had a headwaiter, a waiter, and a waiter’s assistant, none of whom spoke English as a first language. The headwaiter was from South Africa, the waiter from Chile, and the assistant from Peru. Some of the conversations were very interesting; especially once you throw in my “hearing challenged” father-in-law. My family had trouble with the assistant waiter, whose primary responsibilities consisted of serving drinks and bread. He was very slow and sometimes would act as if he heard our requests but didn’t follow through. It seemed like some things were getting lost in translation. We weren’t sure if he didn’t care or if he really didn’t understand what we were saying. Regardless, this situation became very frustrating. The second night our South African headwaiter asked if the service was good. She was sincerely asking too, it wasn’t the pat “I have to ask this so I’m going to” kind of question, she really wanted to know. We let her know the problems we were having. She explained to us that the assistant was new and the staff sometimes had trouble communicating with the Peruvian employees, a lot gets lost in translation. She wasn’t overly apologetic; she simply expressed her gratitude for our feedback and said it would be taken care of. From that point on, we had fantastic service. The service was already out of this world, but this simple conversation made it even better. The assistant waiter never appeared surly or angry, we never would have known if anybody had spoken with him about our complaint. “Be Like a South African Waiter,” means to always have an attitude of service. Always have the mindset of “How can I help.” As common a principle as this is, it is far too often overlooked or taken for granted. Our South African waiter was of service to us, the customers, and the assistant waiter, her employee. She wasn’t simply sucking up to my family with a false “the customer is always right” kind of attitude. She sincerely wanted to help everyone involved. As a result of her attitude, everyone was helped. The more you can be like a South African waiter, the better you will feel about yourself. As a result your relationships will improve, even those that are already good.